Nine years ago I walked through the local Humane Society's helping my Mom pick out a cat. I had only just lost my first dog Jack and was still grieving and lying to myself - no more dogs, never again, hurts too much. Just out of curiosity I went to check the kennels. EVERY kennel was full. Such a sad sight. I walked along looking at each dog, each one barking or whining, or growling from fear. All but one. This skinny, rough looking mixed breed. Tag said, Shepherd/Husky/Rottie mix. He was sitting a foot from the kennel gate, leaning against the wall. He looked up at me, but never made a sound. When I knelt down to talk to him he came closer. Disobeying the rules I put my hand through the bars; a mmoment later he put his paw in my hand. Still no sound came from him. A wave of emotion overcame me. So strong, an incredible feeling of lonliness and rejection and utter sadness. I'm not one to show emotions in public, but now I was sitting on the kennel floor, holding his paw and crying for him. I thought, "this dog has never been loved". 10 minutes later my Mom and I were outside walking this dog, trying him out. 5 minutes later I was inside filling out the adoption paperwork. I was told they would have to do a home and yard check, and check with the vet I was going to. They'd let me know in a day or two if I could take him home. After a few more minutes together one lady took him back to the kennel while the other lady behind the counter told me his story. This boy was approx. 2 years old and had had a very rough life. He'd suffered through a lot of abuse and neglect, had never set foot inside a house , and had no idea people could be good to him. In the end the owner threw him away because he was "useless". Tears streamed down my face as I listened. How can people be so cruel? I asked to spend more time with him before I left. He was brought out again and after my mom agreed to come by later for me I sat out in the grass with him for hours. Out there he relaxed and soon fell asleep in my arms. I cried some more. I came home with my dog that very night. The girls at the humane society waved the home and vet checks, told me he was MY dog, take him home and love him. That was nine years ago. A lot of patience and understanding and training were needed. There were times he made me want to pull my hair out. I hung in there. I have never regretted a moment of it. He is my Big Behr-Behr. Today he is loving and affectionate; loyal and protective; goofy, a clown. He follows me around like a shadow. A 95lb lap dog. And now, tonight, as he lies beside me on the couch I worry for him. You see a year ago he started having health problems. A trip to the emergency vet found his liver was failing. They told me to let him go, he wouldn't live the night anyhow. I said "this is MY DOG, he's coming home with me tonight". With a lot of care and medication he pulled through, felt better and returned to his normal bouncy self, but this past year has brought other illnesses and many vet visits and medications. He's fighting these illnesses yet joins me (along with his brother and sister) for daily walks, swims, car rides and games of fetch. For nine years he's occupied the foot of my bed and i'm not ready to see an empty spot there yet. And so I write this tonight for him: I tell him as I type that every challenge was worth it, There are no regrets. And i write this to ask if any who read this will say a silent prayer for Behr that he not be taken from me too soon. I may have taken him out of a shelter, but he took me out of my ho-hum life. He gave me challenges, taught me patience, forgiveness, loyalty and unconditional love. I love HIM - unconditionally. MY Dog Behr. Where there is love, there is a reason for living. I hope he knows how much I love him. He's the clown in the middle. He wasn't born a purebred but he's the perfect GSD in my eyes. I felt sooo bad for Bear . Dogs are not stupid . People are ! If only they put some time and effort into their animals their loving side will come out . Put nothing in get nothing out . You have reached out to him and given him a life worth living and he in turn has given back . I pray for you and Behr . My God Bless him and keep him safe. Behr has a wonderful life because of you and your family. I prayed for him to get better. Tonight as in any other night I thank God for my Fur-children that have passed on as well as the 3 German Shepherd Dogs and Lab I have now. 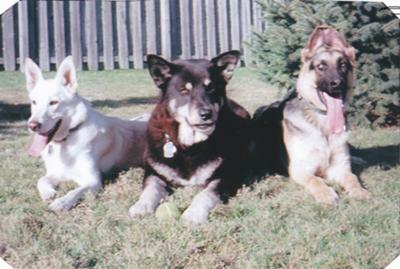 Molley (GSD), Morphieus (GSD), Princess (GSD), Stanley (GSD), Pepper (LAB) and POOHCAT have returned to God. The pain and grief associated with loosing these guys was almost too much to bare and if it wasn't for the 4 that I still have I would probably have given up. Unfortunately,moving on is is a part of life and we too will move on someday. When it's Behr's time he will be summoned back to God. God has trusted in you to care of Behr and from what you say you have been tested. Many feel Dogs have no Soul and that only people do but there are some of us that believe that God has created everything living and all has purpose. It is interesting that God spelled backwards is DOG! My purpose here is to praise you for taking care of BEHR. God created this situation for the reason only he knows but be sure he is guiding you to do the right thing. I will add Behr to my prayers. God bless you and Behr. As I sit here shedding tears, I pray for Behr and for you---hopefully Behr will not be taken too soon, but...remember, you will ALWAYS have memories!!! I lost my Harley, a GSD, 3 years ago--it is hard, but what I do is...just, thing of the memories and look at all of the pictures--it helps!!!! just pray for a peaceful passing for Behr, his suffering was over when you adopted him!!! As an animal lover and mother of three furry babies who lost pets in the past, I totally understand your pain. I am praying for Behr to overcome his health problems and to beautify your life with his presence for many years to come.